The Correspondent of the News Agency of Nigeria (NAN) reports that Agah, who hails from Benue, was first appointed as Deputy Director-General of WTO in 2013 for a four-year term, which he assumed on Oct.1 that year. He will resume his second term at the WTO headquarters in Geneva on Oct. 1, 2017 till Sept. 30, 2021. The Director-General of WTO, Roberto Azevêdo, announced the appointment of Agah alongside three other Deputy Directors-General. Azevedo said “serving Deputy Directors-General Yonov Frederick Agah of Nigeria, Karl Brauner of Germany and Yi Xiaozhun of China have been reappointed to serve a further four year term, and will continue to fulfil their current responsibilities. “They will be joined by a new Deputy Director-General from the United States, Alan Wolff, who will replace David Shark. “I want to thank the Deputy Directors-General for their excellent work over the last four years. “I am delighted to confirm that Frederick Agah, Karl Brauner and Yi Xiaozhun will continue in their roles for a second term. The 164-member countries’ organisation is the only global international body that deals with the rules of trade between nations to help producers of goods and services, exporters, and importers to conduct their business. 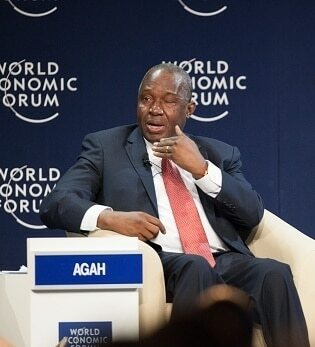 Agah was appointed as Nigeria’s Ambassador to the WTO in 2005. In that capacity, he served as the Alternate Chief Negotiator for the Doha Round and Head of Nigeria’s Trade Office to the WTO in the Permanent Mission of Nigeria to the United Nations Office in Geneva. The Trade Office is responsible for Nigeria’s participation in Geneva-based trade-related international organisations,, particularly the UN Conference on Trade and Development, the World Intellectual Property Organisation, the International Trade Centre and the WTO. The WTO deputy chief served as Chair to WTO’s General Council in 2011. He was responsible for organising the Eighth WTO Ministerial Conference, which was acknowledged to be successful in spite of prevailing stalemate in the Doha Round. He also served as Chair of the Dispute Settlement Body in 2010 and the Council for Trade in Services in 2009. He was also the chair of the Trade Policy Review Body in 2008, the Council for Trade-Related Aspects of Intellectual Property Rights in 2007, and the Council for Trade in Goods in 2006. He chaired the Council for the Agreement on Trade-Related Aspects of Intellectual Property Rights – an international legal agreement between all the member nations of the – Special Session, in 2013. Agah had previously worked as a lecturer at Kaduna Polytechnic, Kaduna State from 1979 to 1981 and Senior Features Writer/Circulation Manager, Benue Printing and Publishing Corporation from 1982 to 1984. He was Sales Manager, Benue Bottling Company Limited from 1984 to 1987, Field Manager, UTC Nigeria PLC from 1990 to 1991, Deputy Director (Multilateral) from 1991 to 2001 and Director (External Trade) from 2002 to 2005. Born on Aug. 28, 1956, Agah holds a Bachelor of Science and Master of Science in Economics from Ahmadu Bello University, Zaria. He obtained a Master of Business Administration and Doctor of Philosophy in Economics (International Trade) from University of Jos in 1989 and 2007. His doctoral dissertation was on “Trade Policy Reform and Economic Growth in Nigeria Since 1986”.